Hello, lovelies! This season, I'm into showing off bare shoulders and shorts. Anyway that I can feel comfortable and not sticky due to summer heat. In connection to what I've said, the products I ordered from DRESSLILY are something that will make my mood bright. You know, this summer heat tends to put us to some uncomfortable situation but nothing will light up and ease such mood with wearing pastels and interesting patterns or lines. This light pink ladylike solid color ruffles bell sleeves is not what I really expected. Honestly, I'm a bit disappointed. I love the design and style of the elastic on the body and on the sleeves. The shoulder doesn't run up. The only thing that is off was the fabric. It wasn't the same as it claimed in the pictures on product page and the color must be a bit darker. The size have only one-size but it fits my medium frame just fine. I get attracted to this women's striped denim shorts just like when I get attracted to blue denim and chambray. The placing of stripes in opposite and unruly directions made this shorts looked chic. 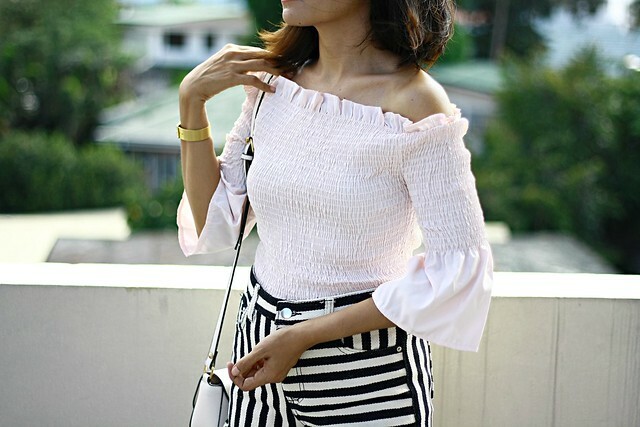 I also the idea of the high-waisted because this is perfect for this season; perfect to pair with crop tops. The frayed hem added beauty, too. Agree? It is true to size; their medium size fits perfect on me. The shorts are so much fun!